Visit Fort Cochin, St. Frances Church, Jewish synagogue and Dutch Palace. Boat cruise on a the Periyar Lake. Visit the Periyar Wildlife Sanctuary and Tiger Reserve. Let us make it unique for you with our exclusive private tour package. Our six nights and seven days package will make you feel different with idyllic destinations like Cochin, Varkala, Kumarakom and Periyar. We have chosen liveliest attractions and renowned destinations to make you feel excited every second. Our extravagance package takes you on sightseeing trip, beach, sunset cruise, backwater ride, strolling through mangrove forests, elephant safari, bird watching and much more. On arrival at Cochin Airport/Ernakulam Railway Station, our representative transfer you to hotel. Afterward we will continue your tour for a sightseeing of Cochin, Relaxation is the key word in this beautiful part of Kerala. You can get Ayurvedic massages, houseboat rides to walk around the backwaters, yoga classes or just laze around and enjoy the natural beauty of the region. This tour is also covering places of interest, including Dutch Palace, Jewish Synagogue, Jews Street, St. Francis Church, Chinese Fishing Net and Indo-Portuguese Museum. Afterward we will drive you to Varkala, is a sea side resort, as well as an important Hindu centre of pilgrimage. Check in at a hotel and relax for the remaining part of the day. In the early morning after leisurely breakfast we will drive you to Varkala . High cliffs border with rich mineral springs rise majestically from the coastline and the excellent beach, Varkala is a beautiful beach that has a more than 2000 years old shrine of Lord Vishnu. The 2000 year old Janardana Swamy Temple and the Nature Centre are the two main attractions of Varkala Beach. A dip in the holy waters of Varkala beach is believed to purge the body and the soul of all the sins hence the name 'Papanashini' for this shore. In the morning after breakfast check out of the hotel and we drive down to Kumarakom. On arrival at Kumarakom you will see the Kumarakom Bird Sanctuary afterward check in at hotel in, Evening go for Sunset cruise and take pleasure in the beauty of backwater by just relaxing near Vembanadu Lake. 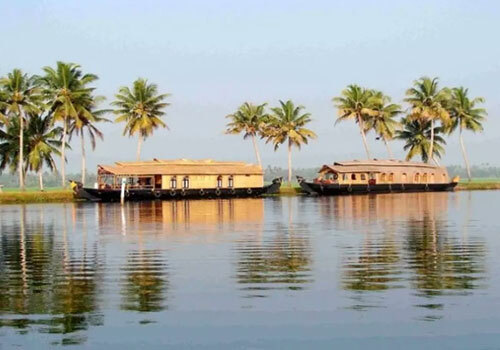 Kumarakom - Eye-catching paradise of mangrove forests, bright green paddy fields and coconut groves interspersed with captivating waterways and canals adorned with white lilies, the village of Kumarakom is a cluster of little islands on the Vembanad Lake. Nearby also offer comfortable accommodation and exclusive leisure options like an ayurvedic massage, yoga, meditation, boating, fishing, angling and swimming. Arrive at Kumarakom and visit the Kumarakom Bird Sanctuary (famous for migratory and local birds). Stay overnight at Kumarakom Hotel. After morning breakfast drive to drive to the Periyar 110 kms. On arrival transfer to hotel, afterward we will visit to the nearby bird sanctuary and boatcruise on the Lake of the famous Periyar wildlife sanctuary to see wildlife. Periyar lake is the heart of the Wildlife Sanctuary wild elephants, Asiatic Deer, Black Buck and even Tigers come to shores of the lake for a drink. Thereafter at leisure to explore the neighboring spice market. Periyar is a well-liked Wildlife Sanctuary, full up with great scenic charm and rich bio-diversity. This sanctuary ranks as one of the major tiger reserves in India. On your tour to Periyar you can visit the Periyar Wildlife Sanctuary and Tiger Reserve. A safe haven to many mammals, reptiles and amphibians and around 320 avian species. If you are lucky enough you can spot more exotic animals which may also be seen on a day excursion to nearby Eravikulam National Park near Munnar. Don't forget to take your binoculars!